The highly anticipated Netflix Original premieres on the streaming platform this Friday, November 16th. 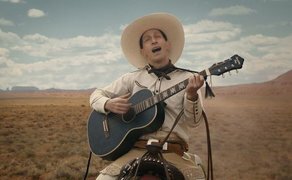 The newest film from Joel and Ethan Coen, ‘The Ballad of Buster Scruggs’ is a six-part Western anthology film, a series of tales about the American frontier told through the unique and incomparable voice of the American filmmaking duo. Each chapter of the film tells a distinct story about the American West. Irish actors Liam Neeson and Brendan Gleeson star in the project with Tim Blake Nelson as the eponymous character, alongside James Franco, Tom Waits, Bill Heck, Zoe Kazan and Tyne Daly. Joel and Ethan Coen produced the project with Megan Ellison and Sue Naegle. The Western has already been selected for screenings at the New York Film Festival, AFI Film Festival and BFI London Film Festival. Joel and Ethan Coen also picked up the award for Best Screenplay at the 75th Venice Film Festival in September. ‘The Ballad of Buster Scruggs’ premieres on Netflix –Friday, November 16th.